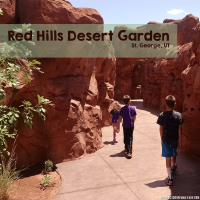 St. George gets unbearably hot in the summertime, but kids still need to get outside to play. We have quite a few public parks that offer a splash pad or water feature (free of charge!) to help keep you and the kiddos cool. 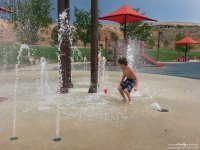 Here is a list of splash pads in St. George, UT as well as nearby cities. Main street has a lot of options for water play. There is the lazy river, rock steps and the splash pad. All water features are close together allowing parents to find a place under the covered canopies while letting the kids explore and have fun. Don’t forget to put your feet in the water. 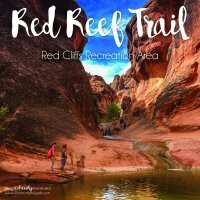 Check out what else Main Street has to offer here. Dubbed “the red park” in our house, Hidden Valley Park quickly became a family favorite nearly 8+ years ago. Our kids love the variety of toys and the soft padded ground. The bucket dump and splash pad are in such close proximity of the play ground that the kids don’t feel like they have to choose what they want to do. They can easily flow between playing and as parents we don’t have to follow them around. The park is very contained and keeps all play areas close to each other. Excellent bathrooms that are always clean, along with tennis courts, and sand volleyball areas — which quickly turn in to sand fun for the littles. Thunder Junction recently opened in 2016. It is a very popular park because of the vast play area and wonderful play options for those with special needs. Tucked in the back of the park is also a water feature with a cozy rock walkway and waterfall. 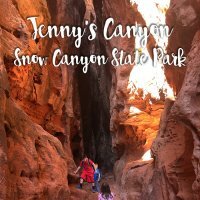 This park does get packed with people on sunny days so be sure you bring your patience and get there a bit early to make sure you can find a place to park your family. I also would like to remind families that do not have kids with special needs to pay attention to kids and visitors with special needs; certain play areas are made especially for them. Please ensure your children let them take turns since they are able to play in other areas. Basically be courteous and kind. 🙂 Don’t forget to take a ride on the train! It is only $1 per ride and the kids love it. Don’t let the line scare you — it moves pretty fast. If you live in the Santa Clara/Ivins area, this is going to be the closest park to you. It is small and the splash pad and water feature are more suitable to younger children. If you have 7+ year old, they may get bored quickly. Or make sure to bring things like water toys and buckets to help keep things interesting. The “cons” to this park (as a parent) are 1) there is no play area in close proximity to the splash pad and 2) the bathrooms are REALLY far away. If you have only 1 child with you it isn’t a big deal to walk away, but when I had 3 with me, I have to tell everyone to stop playing to come with us to the bathroom. I didn’t have a child old enough to stay and watch the other, so this was a big con to me. There is a lot of grass area to sit on with some trees for shade, so that is a nice bonus. This park is tucked behind the fishing pond and soccer fields. There is a great playground with very clean bathrooms nearby. There is a fun water feature which is similar to Thunder Junction (above). I love that the park and water are right next to each other. If you visit this park when there are no soccer tournaments, there is a TON of grass to play in. However, there aren’t a lot of trees and the only shade is under the eating gazebo or by the bathrooms. If you attend when there are soccer games going on, be prepared. It will be BUSY! Click here for a full review of this park. The Fields are mostly known for their softball and baseball fields, along with their MANY pickle ball courts. Between the softball field and pickle ball field is a pretty fun playground. 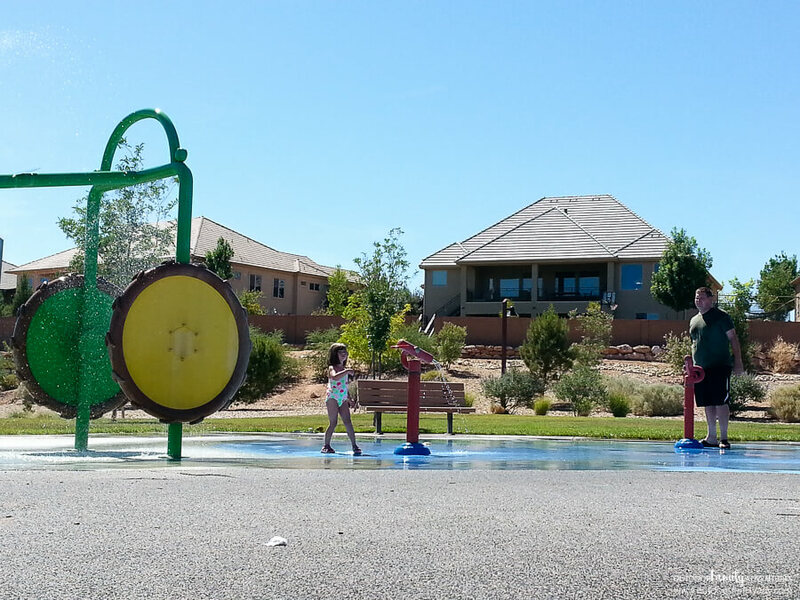 This playground also has a splash pad with water guns for getting in an epic water battle. The splash pad is close to bathrooms and the other play areas making it an easy outing for parents. There is some shade and benches for sitting, but not tons. I love the ground which is the padded rubber which makes slipping less likely and not as painful as scorching cement. This park can become quiet crowded during sports tournaments but when the sports game aren’t happening, it is usually a pretty quiet park. Pine View Park can be found tucked inside a neighborhood just off of Mall Drive, past the new Lin’s. This is a great park if you just want to splash around for a bit and have access to shade, bathrooms and a playground. Also close by are tennis courts. This park satisfied my children when they were quite young (toddler and a bit older), but it may be too simple for the older kids. Sienna Hills Park includes a 1,000 square foot splash pad with water features, playground structures, half-court basketball pad, picnic areas and spacious pavilions. This park can be found in the Sienna Hills community just off Washington Parkway, between 1-15 and Telegraph Road. Located directly above the city owned golf course, this park includes pickle ball courts, half-court basketball, 1,500 square foot splash pad and a large covered playground for children. Includes a splash pad, large playground, softball and soccer fields, restrooms and so much more. Found off of Santa Clara Drive. These look like so much fun! It’s always good to find new things to do with the family. It’s so true that splash pads are a great way to keep your kids cool and having fun in the summer. 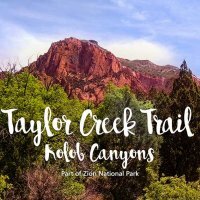 We will make sure to visit some of these when we are in town. I was just wondering if/when the water features get turned off. We plan to visit the third week of September. In MN all splash parks close for the year on Labor Day. If temps are really in the 80s (or even 70s) we would definitely make use of them.